Maybe it took a 1-yard punt, a Heisman-candidate quarterback more than tripling his season interception total, and Ross Bowers front-flipping into the end zone for a touchdown. 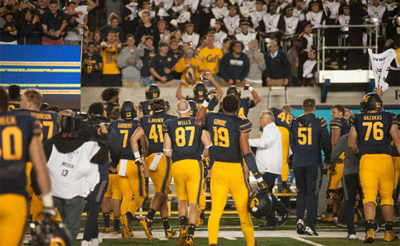 But it’s hard to argue that Cal football didn’t make its own luck in its massive upset of No. 8 Washington State. The rapidly improving defense had its best game of the season, and the offense played mistake-free. The end result? A 37-3 win that broke a three-game losing streak with a stunning top-10 toppling. What was the biggest key to holding a top-20 offense to three points? To picking off quarterback Luke Falk five times after he had thrown two picks in the first six games of his season? Pride and revenge, of course. Cal’s defensive line, which had been pushed around by Oregon and Washington the past two weeks, clearly came out with something to prove. They put consistent pressure on Falk from the first snap. Luc Bequette and Tevin Paul were at their most aggressive, and James Looney and Alex Funches continued to look more and more comfortable in defensive coordinator Tim DeRuyter’s scheme. WSU’s first drive ended on a pick when pressure forced Falk to loft a ball that Camryn Bynum made a quick reaction towards. The Cougars’ second drive ended in a missed field goal, and the third on a forced fumble by Jaylinn Hawkins. There was no questioning it — the Bears were fired up. The offense could only parlay Falk’s initial interception, which placed Cal at WSU’s 14-yard line, into a field goal. 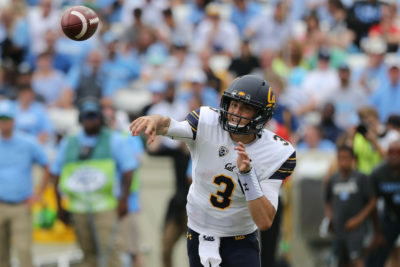 Two more ugly three-and-outs followed (Bowers finished 2-8 in the first quarter), but after Bequette sacked Falk, a punt in the wrong direction allowed Cal to start at the 23-yard line with under six minutes remaining. Facing 2nd and goal, offensive coordinator Beau Baldwin dialed up a unique play, to say the least. Desperately in need of a revived rushing offense, Baldwin pulled out all the stops and called a weak side run from a pistol formation with three tight ends. Vic Enwere dragged a helpless Cougar into the end zone to give Cal a 10-0 lead. On the next drive, a timely run stuff courtesy of Looney cost the Cougars eight yards in the red zone. Another sack by Cameron Goode almost took Washington State out of field goal range, but WSU kicker Erik Powell nailed a 52-yarder to put the Cougars on the board and cut Cal’s lead to 10-3. Two penalties on left tackle Kamryn Bennett (false start, ineligible receiver downfield) cost the Bears a chance at a score on the next drive after Bowers got into a good rhythm by nailing some short throws. A lengthy 12-play drive with three third-down conversions had the feeling of an inevitable Cougars score. Bynum, however, had other plans and reeled in his second pick, reading the quarterback’s eyes from the snap and making a perfect play on the throw. With a minute left in the first half, a muffed Cougars punt went for a grand total of one yard and gave the Bears the ball at WSU’s 45-yard line. Bowers put together one of the finest drives of his young career, going 6/6 on the drive and capping it off with a great throw on play action with no time remaining in the half to Kyle Wells, giving Cal a 17-3 halftime lead. The defense had no intentions of slowing down in the second half, picking Falk off twice in the third quarter and adding injury to insult with four sacks and a handful of additional quarterback hits. Neither offense could get much of anything going however, and the only score came on a 46-yard kick from Cal’s Matt Anderson. Enwere finally got things truly going on the ground on the last drive of the third quarter, which dragged into the fourth, accounting for 58 rushing yards and almost tripling his then-total. 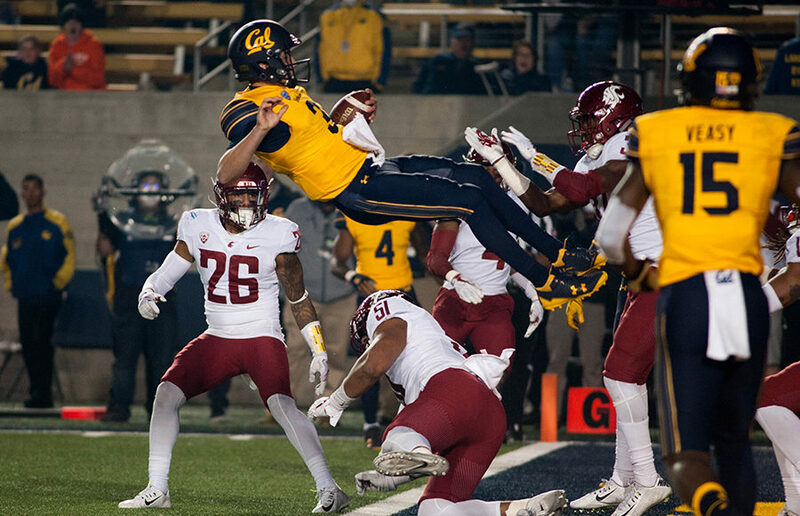 If there was any question that Cal’s win was fated, it was eliminated with Bowers’ front-flip into the endzone for a 7-yard touchdown, almost an exact replica of a play he pulled off in high school that initially put him on the national map — 27-3 Bears. Cal’s offense was content to run the rest of the game out, but the defense was intent on embarrassing Falk even further. With five minutes remaining, Jordan Kunaszyk forced a fumble on a massive sack and Gerran Brown brought the ball in for a fumble to extend the lead to an absurd 36-3. A 20-point underdog had roared to a 30-point lead. Falk’s fifth interception of the contest almost made the game a farce. Amid the smoke, it took a game many argued shouldn’t take place for Cal to pull of its first defeat of a top-10 opponent in 14 years. 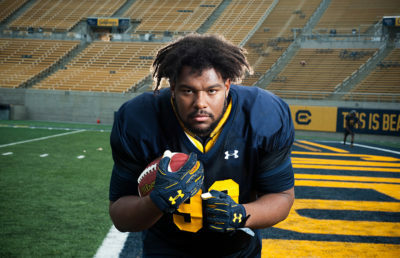 Wilcox and the Bears wouldn’t have it any other way.